Periodically, I take a hard look at my closet to see whether I could make more or better use of the clothes therein. One of my methods is to focus on color. I select a color and pull out everything of that particular color (regardless of shade, style, or fabric) to see what might go with what. Today, we’ll look at the greens. 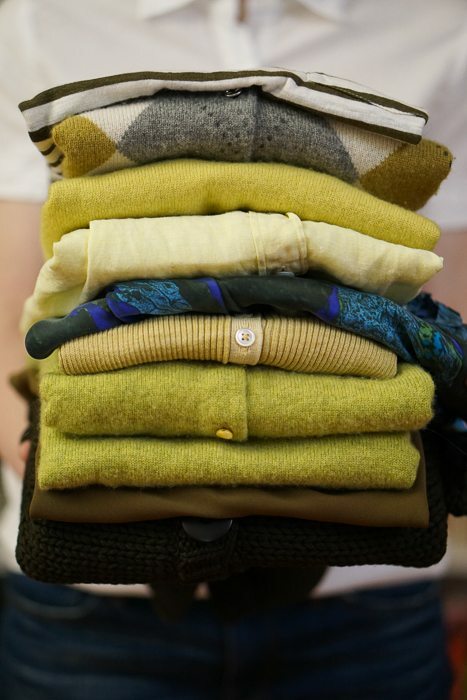 Behold the green blouses and sweaters of my closet! Disclosure: I have two fatigue green jackets, but they have been excused from this exercise. 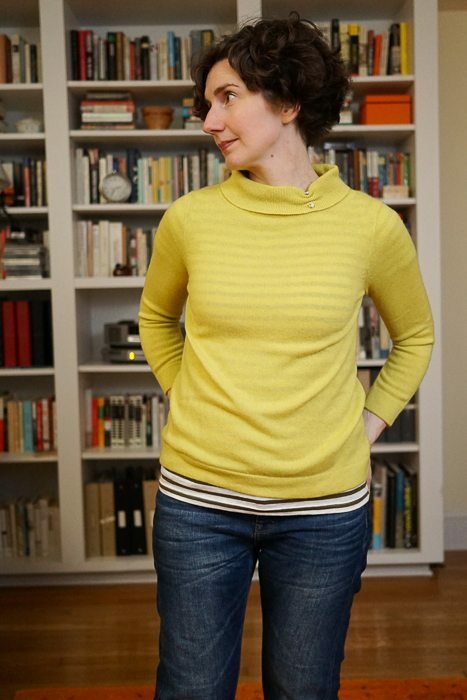 a light chartreuse rollneck pullover also from JCrew. 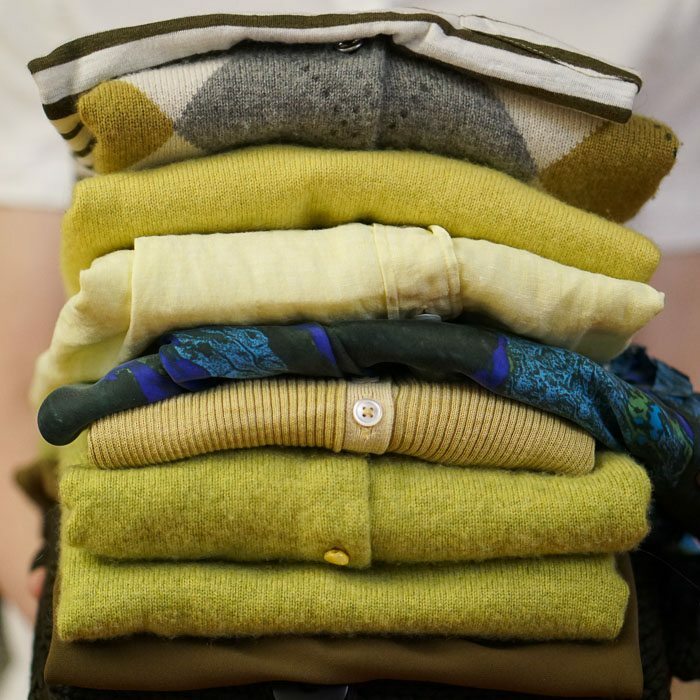 Obviously, the chunky dark green cardigan would work well with the olive green striped tee-shirt. That’s child’s play. But Chunky Dark Green is turning out to be the Jose Oquendo of this exercise. So, who are the loners here? I didn’t find a match amidst the greens for the argyle sweater or the olive green cowl neck top. Ease your mind. The argyle sweater looks good with a white top, a grey tee-shirt, or a micro-striped (white/grey) tee-shirt underneath. 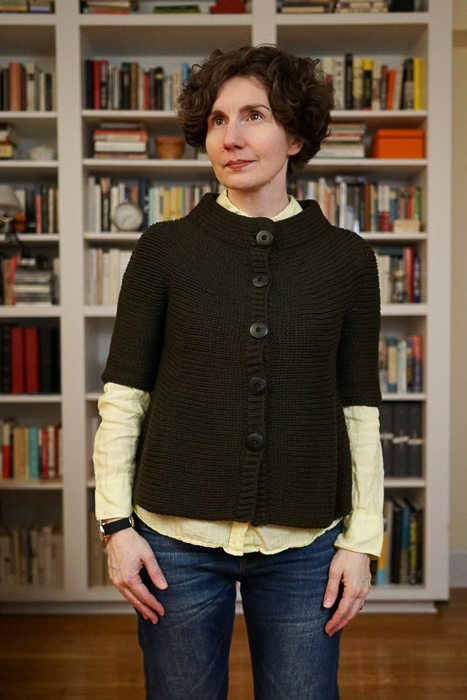 The olive green cowl neck looks very good with one of my un-pictured green fatigue jackets. Seeing how the greens do (and don’t) work together prompts a little more thinking about these particular greens. 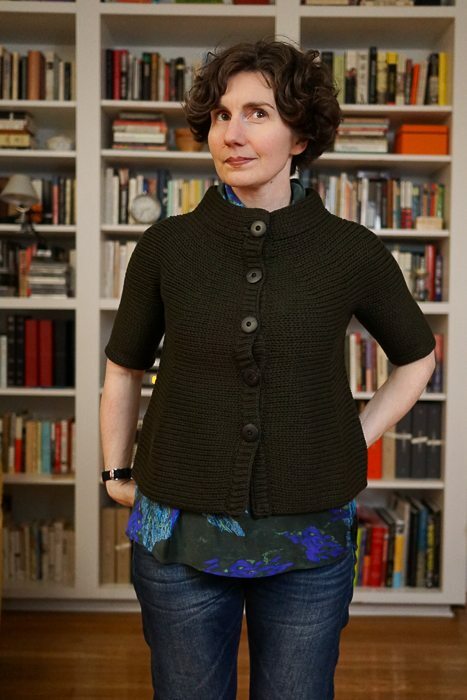 The Margaret O’Leary sweater looks brighter in the photos above than it does in person; it is such a dour shade of green (a brown-green) that it looks better with intense, dark blues than greens. I generally wear it with a navy poplin jacket or an ultramarine cardigan. 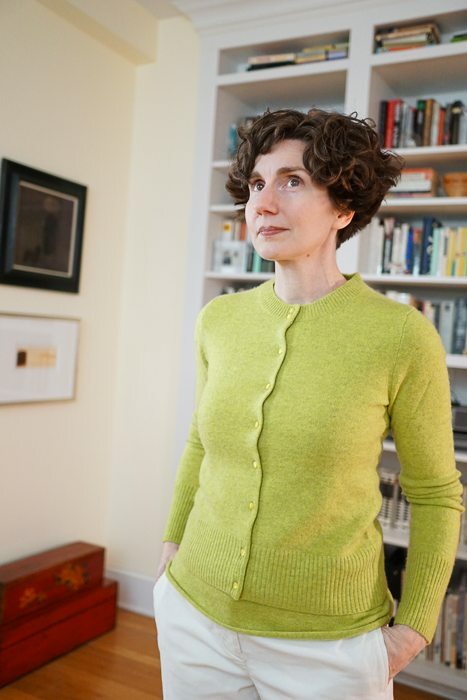 The apple green sweaters are such an extraordinary color that they stand on their own, but they also are very striking with teal and other rich, blue-green shades. Perhaps you are wondering who Jose Oquendo is? A St. Louis Cardinal who, over the course of an 11 year major league career, played every defensive position including pitcher and catcher. That’s utility. 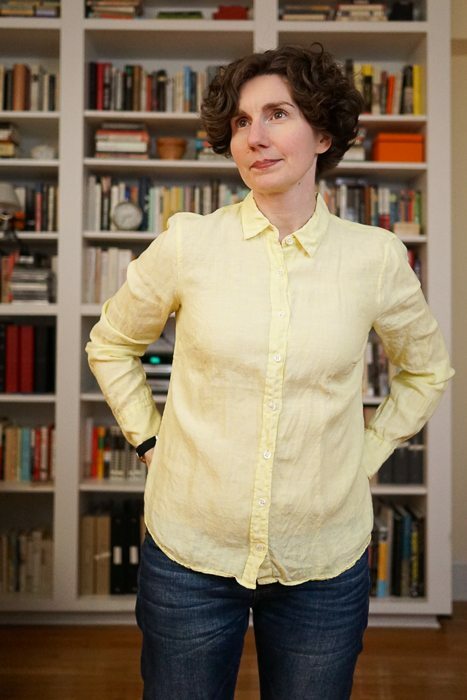 I’m wondering why the argyle works with neither the striped t-shirt nor the citron linen? And how does it do with the apple-green shell from the twin set? Forgive me for not remembering from your archives, but am I correct in deducing from this exercise that your cardigans are for wearing fully buttoned only? This interests me, as mine are almost invariably worn open, or only partially buttoned (unless I get cold and do them up). I like seeing all the combinations here. I hadn’t thought about it until you asked, Jessica, but I guess I am generally buttoned up! 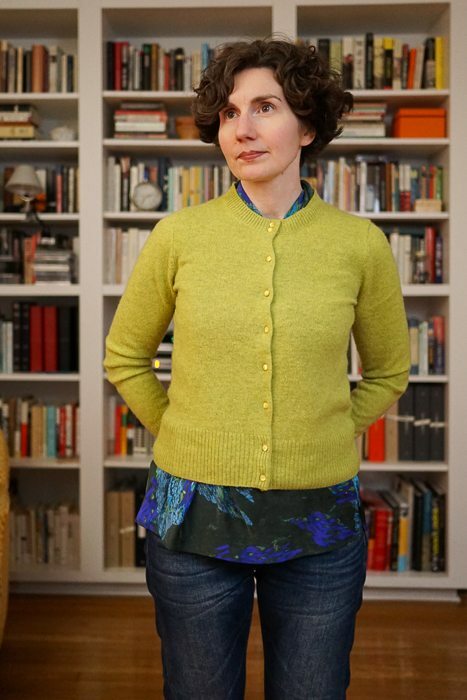 I do have a few heavy-weight cardigans that I am inclined to wear unbuttoned, but with a relatively light-weight round neck cardigan, I usually leave only the top and bottom buttons undone. The argyle is a muddy color and the apple green is an acidic one and those two values don’t work well together. 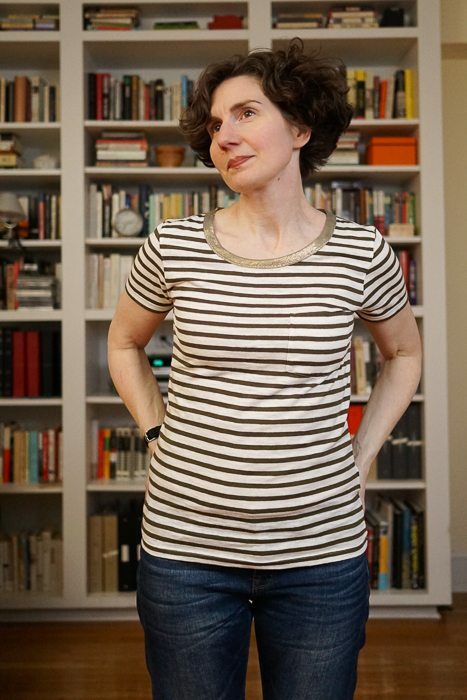 The striped tee was the right type of color to wear with the argyle, but the stripes showed through the ivory in the argyle pattern too assertively. I was hoping that in the new year, you’d give us a peek into your process. Thank you! Question. How do you remember the outfits/combinations? Do you take notes, or better yet photos? I have a pretty good memory, so I don’t take notes or photos — though that is a good idea for someone who has a plan for keeping the notes/photos organized. I do write down packing lists for trips — i.e., the contents of a capsule wardrobe for a two week trip — and keep those from year to year. It saves me a lot of scrambling when I am packing for vacation, which is often late at night, the night before we depart. I love this peek into your process. The idea of working by color is such a good one — I’m going to try that soon! 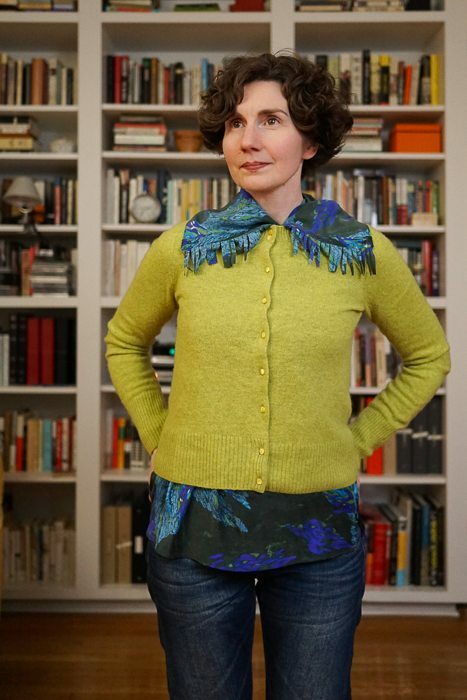 I think I would put the fringed collar shirt out, but unbutton the cardi about 1/3 of the way, so that you would get more of the shirt’s movement and asymmetry. Would that work? Oh, and having just written a piece (for my day job) that turns on baseball metaphors, I appreciate the Jose Oquendo reference! Hi Sarah: Jose Oquendo was a test for my father. Let it never be said that The Directrice is not a general interest publication! Please send me a link to your piece when it’s published. What a helpful post! You are inspiring me to pull out some under-utilized sweaters piled back in the closet and assess them with fresh eyes. I knew I wanted to do more layering, especially in these cooler months, and this is a very practical guide to doing it with what we have already. I never know what will be helpful or interesting, so I am glad that this one was both, Bubu. Good luck with your sweaters and the snow. My personal take is that ALL greens go together, so the issue is more fit and shape than color. That said, bright kelly green is tough to work with. I would suggest reversing the layering process to wear the Edun shirt over a long-sleeved top instead, rather than layering a sweater over it. I love the asymmetry, the volume and the pattern and it seems a shame to cover it all up! I will try this, Nonny. 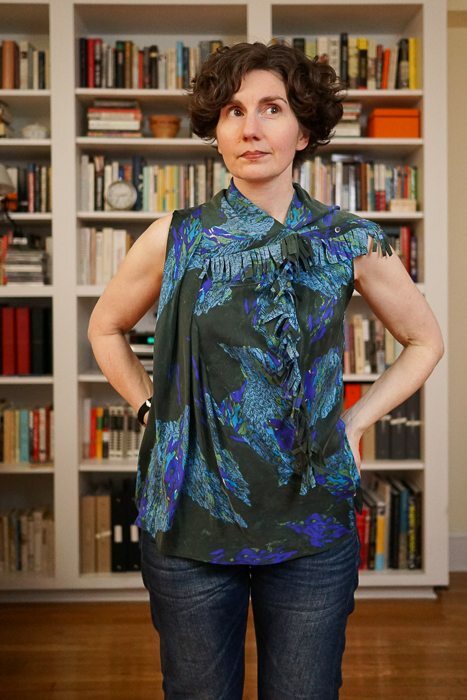 But be assured, the blouse steps out unaccompanied in warmer weather, and then it is on full display. Would also love to know how you remember outfit combinations. I am terrible at this. I spend time figuring out what goes with what, then don’t remember exactly what I did, especially when I haven’t worn something for a while due to changing seasons. Although it’s very cute, I don’t see the point of a chunky half-sleeve cardigan. If it’s chilly enough that I need a sweater, it better have sleeves (and not just a thin blouse worn underneath). If it’s warm enough for half my arm to be bare, I’ll be too hot in a chunky sweater. I rely on memory, Lynne! My memory is good, but not perfect, so I probably re-invent the wheel every year. I think an easy way to minimize “outfit loss” would be to take pictures with your phone and then put all the outfit pictures into one folder. 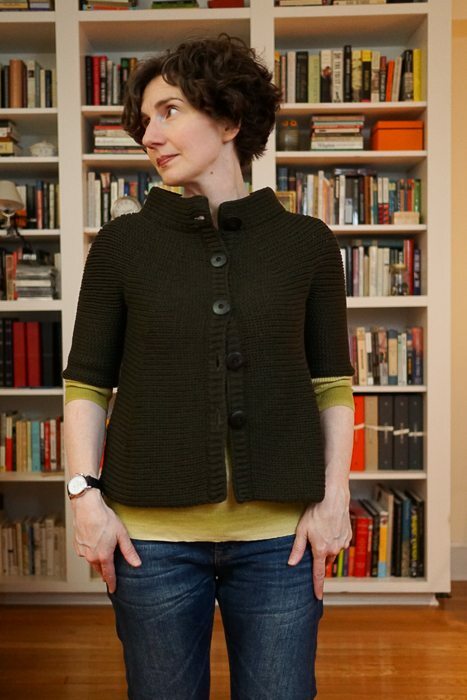 And now, a full-throated defense of the half-sleeve cardigan. I like this style because I often want a little more warmth, but don’t need to feel bundled up. 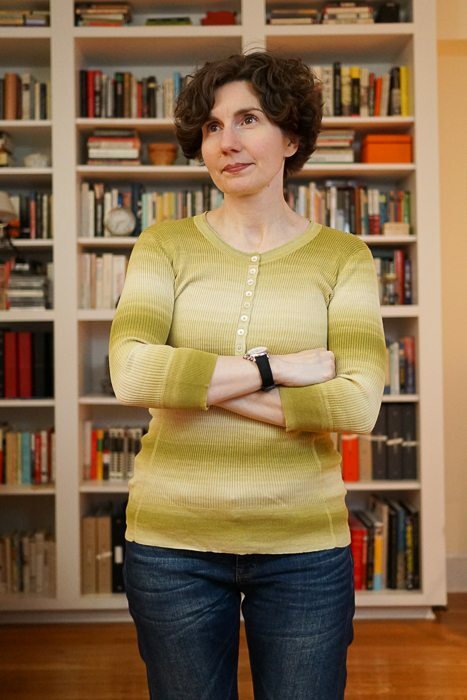 When I wear a half-sleeve cardigan (in the fall and winter) I almost always wear it over a long-sleeve jersey, blouse or lightweight sweater, so my forearms are covered. The other benefit of the half-sleeve, for a small person like me, is that the sleeves aren’t too long. Often the sleeves on long-sleeve sweaters are too long for me and that’s one alteration that does not exist! I will join you in defense of the half-sleeved cardigan for two more reasons: 1) it creates interesting proportions and allows you to feature something interesting on your wrists (be it an underlying sleeve of another color or jewelry) without sacrificing the warmth of the sweater, and 2) if you need to cook, it keeps sleeves safe from staining or catching fire without having to change your whole outfit (an apron helps too). The safety angle! I love it. I’m not joking. (My friends are probably laughing.) 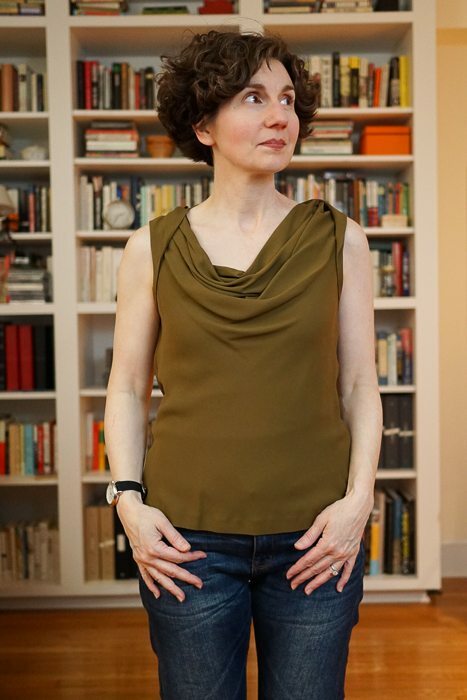 I could start another blog devoted to safe dressing: Safe Chic. For example, wearing a brightly colored hat on a snow day is an excellent idea; it makes you more visible to motorists when the snowbanks are high and street corners/sidewalks are crowded, as they are in Washington D.C. today.